There were two of the most iconic film characters of all time in the room, but decorum made it impossible for any of us to address them. 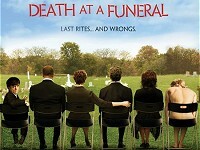 It was a press event for the new British comedy Death at a Funeral, directed by Frank Oz. But it was clear that he was in movie-director mode, and that Miss Piggy and Yoda were taking the day off. Ah well, never mind. Death at a Funeral is in the vein of Oz's previous black comedy Dirty Rotten Scoundrels, using an offbeat mix of bone-dry comedy and zany slapstick. It's no surprise that it got fairly good reviews in America, while British critics were rather harsh. As Oz himself asks the unanswerable question: "What is a British comedy?" He says he was just trying to make a funny movie. "Honest is honest in a film," he continues. "I never asked anyone to be funny, and there was no difference between the British and the American cast members. I just told them that if they were honest to the characters, they'd eventually be funny." He goes on to say, "I like restraint in comedy. I didn't want the actors to play it too broad. It's all about the rhythm, which the actors control. Scenes always seem so much slower on screen than they do on the set, so it's up to the actors to create the pace, and it's up to me to keep them moving." "We had two weeks of rehearsal and that really helped," says Kris Marshall, who plays the chemist in the family and is looking very tall and blond today. "We rehearsed right on the set in real time, which was a great way to meet the cast. It was more like doing a play. And since a lot of us in the film were playing characters who were related, it was good to have the chance to nail down the family connections." "I wish you had that in more films," chimes in a grinning Andy Nyman, who plays the chucklehead Howard. "It really helped. Especially being on the actual set as if it was a real house." "Logistically it was difficult being in one building with 30 people, but the rehearsals made us feel secure and comfortable," says Rupert Graves, who plays the famed novelist brother Robert, back home for his father's funeral. The floaty Daisy Donovan, who plays a cousin who brings an outsider to the family funeral, says, "It helped us stay on a level; no one was at a different height of comedy. It felt smooth, almost musical." "Although the rehearsals didn't get all the giggles out of our system," says Jane Asher, who plays the family matriarch in the film, and is the grand dame here today. "Frank Oz was the worst offender. But at least he kept us on schedule." Asked about which scenes were trickiest to play, Donovan comments that her scenes with Alan Tudyk weren't exactly easy. Not only was she teetering around on the roof in high heels (she forgot to take them off as planned, and ended up breaking several roof tiles), but Tudyk was completely naked in the scene. "I just never looked down," she laughs. "When I was talking to him it was eyeball to eyeball, and I made sure I wasn't eye-level with anything else. It was hard." No one lets this comment pass quietly. Finally someone asks why Oz cast the American Tudyk in the role in the first place. "Actually the character could have been American," he says. "But it was better for Peter Dinklage to be the only American in the story, because he was the interloper. And besides, Alan could do a perfect British accent - he auditioned for the role by phone! And he was extraordinarily committed. He was late to join us; he arrived after we had started rehearsing and had to hit the ground running. Then he had to play it like he was on drugs in every scene." Graves' role is one of the shadier guys in the film. "As an actor, characters who are bad are more fun to sink your teeth into. I didn't seek it out," he says, "but now I seem to play more bad guys. It just happened. When I was younger I always played the fresh-faced roles." During filming, the cast members were encouraged to improvise, but writer Dean Craig is a bit cagey about how much improvisation is in the final film. The cast starts teasing him about this, and Oz leaps to his defence: "You can't improvise without a good script!" To which Marshall replies, "Well, he did come up with the character names!" When asked about their favourite moments of on-screen comedy, the actors naturally defer to their director. "It has to be Steve Martin in that wheelchair in Dirty Rotten Scoundrels," says Asher. After agreement all-round, Kris Marshall picks another one: "I'd say Paul Giamatti's merlot scene in Sideways. When the stakes are that high, the comedy just works. It's the juxtaposition of tragedy with comedy that works for me." Donovan echoes this by citing the finale of Little Miss Sunshine. "In that pageant scene at the end, the mixture of tragedy and comedy is perfect," she says. Nyman notes that he's in awe of everything Michael Palin did in A Fish Called Wanda: "Genius!" And Graves just notes that "anything Julie Walters does is hilarious. I just love her." "It's not like we think death or funerals are funny," says Oz. "We laugh at people trying to hide things, trying to pretend they're not on drugs or to cover up some huge secret. A wedding could be funny if the bride has some huge secret." Asher offers another angle: "There's something about laughing at things that are so awful. It's a sense of relief." And then Miss Piggy and Yoda leave the room, without saying a single word. Somehow we all feel a little cheated.